Here is a project I created with a friend, fellow demonstrator of mine (who prefers not to be mentioned) some time ago. It uses one of my favorite sets, Roses In Winter, although it is retired now (still can't believe it). Any floral set would look GREAT though! All of the "goodies" - the Card, post-it notes block, 2 pens, and Candle/Coaster all fit inside the can! This project, although it contains a lot of pieces, is relatively easy. 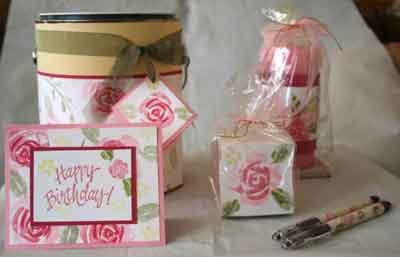 Basically you are just two-step stamping on everything with the Roses In Winter stampset: Big roses (Pretty in Pink base, Rose Red 2nd layer (but with Stamp-off so it's faded), center is just Rose Red; Leaves, stamp off the base in Mellow Moss, then simply stamp Mellow Moss for outline/2nd layer. Very beautiful! Did you just stamp on the side of the post it note block? Yes - I just stamped on the Post-it block. Thanks for visiting. let me know if you have more questions on the projects. Hi! I'm Suzanne, found you by way of a comment on SUDSOL. I'm a 3 year fan of SU! and a new demonstrator. Just placed my 1st month order this morning. Exciting. You have some beautiful ideas. I had our stamp club yesterday and found white paper CD holders, stamped them with rose red/regal rose using the pretty peony set. Filled with a large cookie wrapped in plastic wrap, addd a piece of scrapbook paper in the background, added some ribbon to the top and gave as a gift for the ladies for joining the club...simple and they loved it!